The Bitcoin protocol allows to save arbitrary data on the blockchain through a special instruction of the scripting language, called OP_RETURN. A growing number of protocols exploit this feature to extend the range of applications of the Bitcoin blockchain beyond transfer of currency. A point of debate in the Bitcoin community is whether loading data through OP_RETURN can negatively affect the performance of the Bitcoin network with respect to its primary goal. This paper is an empirical study of the usage of OP_RETURN over the years. We identify several protocols based on OP_RETURN, which we classify by their application domain. We measure the evolution in time of the usage of each protocol, the distribution of OP_RETURN transactions by application domain, and their space consumption. 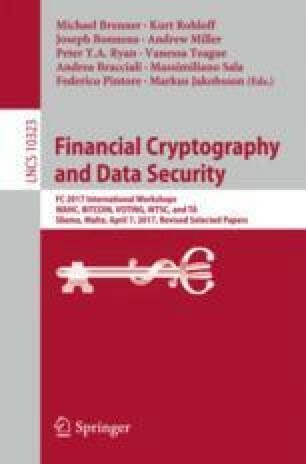 The authors thank the anonymous reviewers of BITCOIN 2017 for their insightful comments on a preliminary version of this paper. This work is partially supported by Aut. Reg. of Sardinia P.I.A. 2013 “NOMAD”.